How’s this headlamp for runners? Watch the video at the bottom of the page to find out more. Is the Fenix HP25 a Good Choice for Runners? I’ve been considering buying a decent headlamp for running and snake hunting for a long time now. For running, there is no substitute for a good headlamp, carrying a flashlight just won’t work well and your hands need to be free to catch you when you fall. Plus it screws up your running dynamic to hold a flashlight in one hand. Assuming you’re not already carrying water bottles. Anyway, you get it – running with a headlamp is the way to go for night time adventures where there are no lights around. But, which headlamp to buy? This Fenix HP25 has been around for years – and guess what? 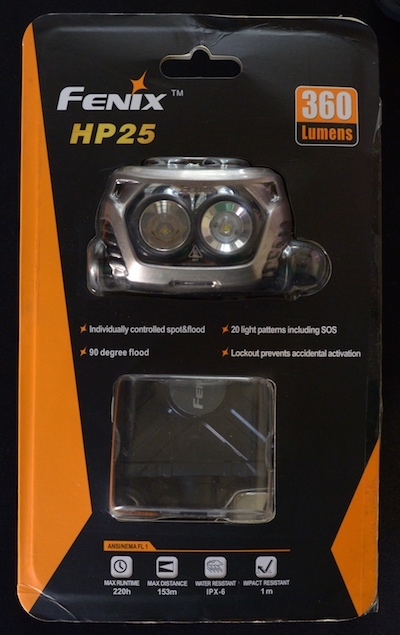 It is still coming in with great ratings when compared with other headlamps. Is this headlamp for you? I think whether or not you do a lot of running in the dark, on the trail or roads, you could definitely use this at home for things like looking in your attic, working on your car, and peeping on the neighbors. The spot beam is incredibly bright, and though I didn’t anything like the claimed 153 meters of reach, it definitely can shine trees bright at 40 meters. Having 2 lights in your headlamp is a plus for runners because it gives a bit more depth than just one. This article will be short and sweet, and just list the Pros and Cons of running with this Fenix HP25 Headlamp, along with some photos. For the full review – watch the video below. Update 2/14/2018 – I’ve used two of these lights for two-years in Thailand’s rainforest, and they are both still in perfect condition. I’ve taken them out about 80 days this past year. Though the Fenix is good for certain scenarios, I think the Petzl Tikka RXP, or the new Nao+ Plus headlamps are so much better, though more expensive. I Strongly Recommend One of the High-end Petzl Nao Headlamps!